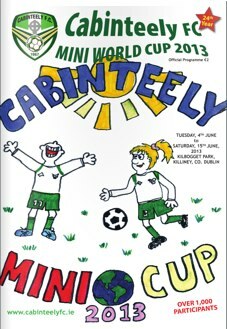 Over the years, Cabinteely FC’s Mini World Cup (MWC) has been the highlight of the summer in Kilbogget Park. It normally takes place in June, over the two weeks immediately after the bank holiday. The MWC is open to all, members and non-members, and now usually attracts well over a thousand young local players of all ages, boys and girls, from pre-schoolers up to U-12s. Up to seventeen pitches are in continuous use throughout the tournament, with most fully ringed by massed ranks of spectators enjoying the games on our warm long summer evenings and weekends. Such is the attendance that cars are parked in all neighbourhoods, at all entrances to the park and in temporary car-parks created within the park itself! 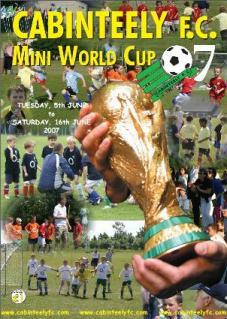 Each year, that season’s U-10 managers and mentors organise and stage the tournament. These are helped by that season’s U-9 managers and mentors who learn the ropes in preparation for their turn the following year. It is a massive feat of organisation and logistics and, each year without fail, some new element is added to the occasion in order to enhance the spectacle and experience for all involved. Section under construction. Have a look in later. 2017 saw our 28th fantastic MWC and, once again, what an extravaganza of football we had to celebrate in a tournament total of 429 games (and 2,002 goals), of which 11 went to extra time, all of which went also to the ultimate excitement and fear that a penalty shoot-out engenders! Well done to the 1,117 players (a huge 215% up on 2006) who played in the 109 teams across a compactly arranged eighteen pitches over the two weeks of the tournament, the hundreds of team managers and assistants, the referees and all the volunteers, all overseen by MWC’17 chief organiser Fergal Young. See the great MWC’17 on-line programme which also highlights the contributions made by our generous patrons and sponsors. Please don’t forget to continue to support these local businesses that help bring the MWC to you. Full details, results, photos etc. of MWC’17 can be found on the event’s dedicated sub-site. 2016 saw our 27th fantastic MWC and, once again, what an extravaganza of football we had to celebrate in a tournament total of 429 games (and 2,374 goals), of which 22 went to extra time and thirteen went to the ultimate excitement and fear that a penalty shoot-out engenders! Well done to the 1,165 players (4.7% up on 2015 and a huge 224% up on 2006) who played in the 109 teams across a compactly arranged eighteen pitches over the two weeks of the tournament, the hundreds of team managers and assistants, the referees and all the volunteers, all overseen by MWC’16 chief organiser Keith Montgomery. See the great MWC’16 on-line programme which also highlights the contributions made by our generous patrons and sponsors. Please don’t forget to continue to support these local businesses that help bring the MWC to you. Full details, results, photos etc. of MWC’16 can be found on the event’s dedicated sub-site. 2015 saw the 26th anniversary MWC and what an extravaganza of football we had to celebrate in a tournament total of 409 games (and 2,125 goals), of which sixteen went to extra time and ten went to the ultimate excitement and fear that a penalty shoot-out engenders! Well done to the 1,113 players (6% up on 2014 and a huge 214% up on 2006) who played in the 108 teams across an all-time high – and compactly re-arranged – eighteen pitches over the two weeks of the tournament, the hundreds of team managers and assistants, the referees and all the volunteers that made MWC’15 chief organiser Gary Kinsella’s task a straightforward one! See the great MWC’15 on-line programme which also highlights the contributions made by our generous patrons and sponsors. Please don’t forget to continue to support these local businesses that help bring the MWC to you. While we had all the usual tournament features for this, the largest-ever edition, a great addition this year was main sponsor Winsdor Motors, Deansgrange’s shooting feature, the Nissan ‘Goal of the Week’, in which many of the players had some great additional fun. Full details, results, photos etc. of MWC’15 can be found on the event’s dedicated sub-site. 2014 saw the 25th anniversary MWC and what an extravaganza of football we had to celebrate! 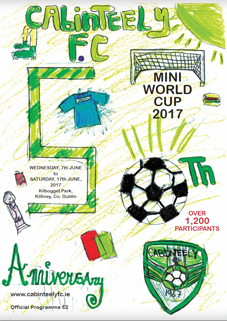 Chief organiser Dermot Byrne and his committee oversaw the biggest-ever MWC, with 1,052 boys and girls playing for 99 teams across seventeen pitches over the two weeks of the tournament. See the great MWC’14 on-line programme which also highlights the contributions made by our generous patrons and sponsors. 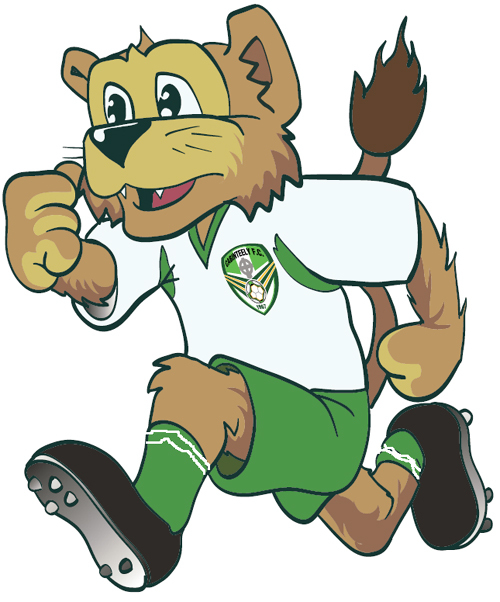 Not only was it the biggest to date, but the organisers also added a number of new features – a shooting wall, a Cabo Stadium backdrop for standard team photos, of which every player received a copy and a new mascot (above), for which they ran a naming competition (‘Capeilé’ was chosen as the winner!). Full details, results, photos etc. of MWC’14 can be found on the event’s dedicated sub-site. For full details of this, the 24th annual MWC tournament, see the great MWC’13 on-line programme which also highlights the contributions made by our generous patrons and sponsors. Details of MWC’13 can be found on the event’s dedicated sub-site. 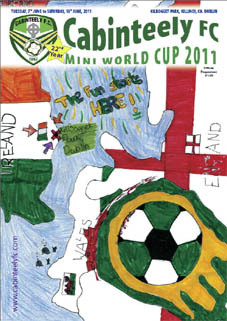 The typical Irish summer weather in June 2012 didn’t dampen the spirits of the 926 young players (11% more than last year) who enjoyed the 379 games (6% up on 2011) of this great community summer extravaganza. In doing so, they played across an unprecedented 16 pitches and scored an entertaining 1,880 goals in the process! What an event! Well done to Chief Organisers Caroline Traynor and Dermot O’Connor, both of whom needed the remainder of June to recuperate, and their legions of volunteers – many being all those regular faces who ensure that each successive year’s MWC is the best ever! Well done to one and all! For full details of this, the 23rd annual MWC tournament, see the great MWC’12 on-line programme which also highlights the contributions made by our generous patrons and sponsors. See also the final league tables, full tournament results and pics of the 100 team groups (a full 14 more than in 2011!). We also have some pics of the play on Jun 5, Jun 9, Jun 10, Jun 12, Jun 13 and Jun 16, together with a few short videos of the action that hopefully will give you a sense of the great event. Don’t forget to turn your volume up to get the full sense of the occasion. 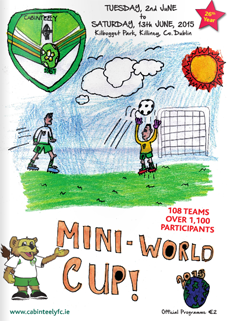 This year, the MWC programme cover design was brought to you by young player Luca Knight, who won the pre-tournament design Colouring competition. MWC’11 saw 836 players playing in 86 teams (an increase of twelve) in twelve groups on twelve pitches over two weeks from June 7. Included in the twelve groups were the three dedicated girls’ group, introducted last year, as well as our Special Needs group. Well done to Chief Organiser Mark Smith and his hard-working committee of Oisín Ledwidge, Karen Hayden, Dermot O’Connor, Paul Knight, Martin Rice, Anita Knight, Patricia Keating, George Davis and Caroline Traynor and chief helpers during the tournament Declan Traynor, Ray Traynor, Aidan Forsythe, Mick Smith, Agnes O’Connor and Geralyn Hartnett. We saw a grand total of 1,667 goals (excluding penalty shoot-outs) during the 357 matches (51, or 16.6% more than last year) – there’s great value for your money! For full details of this, the 22nd annual MWC tournament, see the great MWC’11 on-line programme (click images to the left) which highlights the contributions being made by our generous patrons and sponsors, the final league tables and full tournament results. See also pics of the 86 team groups. We also have some pics of the play on Jun 7, Jun 9, Jun 14, Jun 16 and Jun 18, together with a snippet of video of the awards ceremony on the right that hopefuly will give you a sense of the event. Don’t forget to turn your volume up to get the full sense of the occasion. This year, we’ve also received a great selection of photos, together with musical accompaniments, taken during the tournament by Ann Dunne, one of our parents and stored on Smilebox – see Anne’s shots taken at the early sessions, on June 14 and on the June 18 finals day. Don’t forget to turn your loudspeakers on and enjoy! 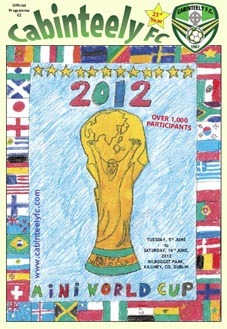 Well done also to Eoin O’Connor, whose winning drawing won the MWC’11 programme cover Colouring competition. MWC’10 was the greatest ever, to date! From its first formal tournament planning meeting March 1, the MWC’10 committee of Oisín Ledwidge, Dermot O’Connor, Mark Smith, Danny McDonald, Owen Devine, Tony Broderick, Patricia Keating, Karen Hayden and Deirdre O’Brien had been hyperactive in ensuring that this year’s tournament was, as ever, the best – always surpassing the previous one! 2010 saw 850 players (14% up on 2009’s 746) playing in 74 teams (an increase of four) in twelve groups (one more than in 2009), playing on ten pitches over two weeks from June 1. Also, for the first time this year, we had three dedicated girls’ groups. We saw a grand total of 1,325 goals (excluding penalty shoot-outs) scored during our MWC’10 two-week extravaganza. We also had eight nailbiting penalty shoot-outs during the tournament this year, with seven of these on the final day, causing scenes of joy and despair, accompanied by whoops of support on all sides all over the park. The goals were scored across 306 games in total – ten more than 2009 – thus providing much entertainment for the many thousands of spectators who attended this great annual community football extragavanza! For full details of the tournament, see the excellent online programme which highlights the contributions being made by our generous patrons and sponsors, the final league tables and full tournament results. See also pics of the 74 team groups. We also have pics of the final presentations and of the seven sessions – June 1, June 3, June 5, June 6, June 8, June 10 and finals day, June 12. 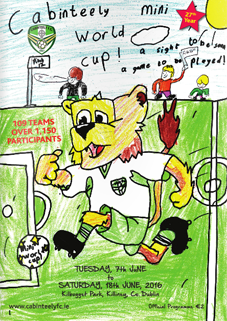 Finally, well done to Thomas Livingston, whose winning drawing won the MWC’10 programme cover Colouring competition. His winning composition formed the cover of this excellent production (right). 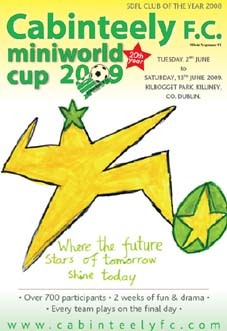 MWC’09 was a great reward for the effort and abilities of our organising committee composed of the 2008/9 U-9 group of mentors and parents, ably led by Age Group Co-ordinator Danny McDonald and mentors Brian Davis, Declan Egan, Dec and Caroline Traynor, Oisín Ledwidge and Dermot O’Connor. This year saw 746 players (23% up on 2008) playing in 70 teams (an increase of fourteen) in eleven groups (one more than in 2008), playing on ten pitches over two (almost) glorious weeks in June. For the first time this year we saw two dedicated girls’ groups which proved really successful for all involved, not least the young female footballers who really enjoyed having pitches four and five all to themselves – no boys at all! 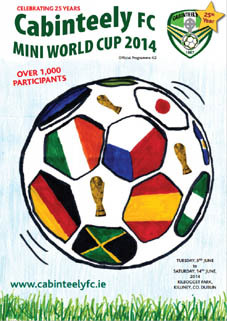 We saw a grand total of 1,035 goals (excluding penalty shoot-outs) scored during our MWC’09 two-week extravaganza. In addition, a further 52 goals were accorded by the organisers in respect of the matches cancelled on June 6. We also had thirteen nailbiting penalty shoot-outs, with no fewer than three of the cup finals decided in this manner! What tension! The goals were scored across 213 group games and 83 play-off and knock-out games – a grand total of 296 great entertainment opportunities for the many thousands of spectators who attended this great annual community football extravaganza! For full details of the tournament, see the excellent online programme which highlights the contributions being made by our generous patrons and sponsors, final league tables and full tournament results. See also pics of the 70 team groups. Hundreds of other, general, tournament pics have been temporarily archived as at May 31, 2010. 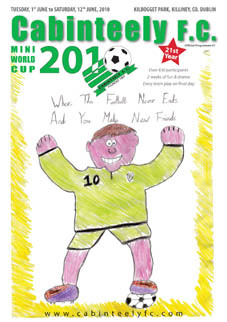 MWC’09 programme cover Colouring Competition: Congratulations to Max Chooi of our 2008/9 SDFL U-11Sat squad for his prize-winning and thought-inducing programme cover design. Max was presented with a full set of club gear by MWC’09 Chief Organiser Danny McDonald to mark his artistic endeavour. Our thanks are due to the many club parents and volunteers who helped organise and manage the event; to Dún Laoghaire Rathdown County Council for their continued support and 2009’s sponsors, who contributed hugely to its success: Commercial Wireless, Select Print & Design, Greenstar, Trinity Fund Administration, Chadwicks Builder Centre, Deerings Butchers Killiney SC, Visual Print Ltd., Bray, fonemenders, Bits & Pizzas restaurant, Dún Laoghaire, Washroom Supplies Ltd., Café Solo, Killiney SC, HemCon Europe, Wild Wicklow Tours, Noel Higgins Hairdressing, Paul O’Callaghan Architects, Fitzpatrick Hotel Group, Mahon Security Installations, Sharavogue Junior School, Solar Advanced Technology, Washroom Supplies and Rushe’s Eurospar, Killiney SC. As ever, our latest MWC, run between June 3 and 14, was superbly organised by Oisín Ledwidge and his great team of assistants. Of course, given the challenge that we set ourselves, this year’s event was no different to previous ones, in that it surpassed them all! On numbers alone, we had 607 players (8.6% up) allocated to 56 teams (an increase of six) in nine groups (one more than 2007), playing on eight pitches. A popular addition this year was the Special Needs group that was thoroughy enjoyed by players and spectators alike. Overall, we saw 783 goals in total – a reasonable average of 3.7 per game – and nine thrilling penalty shoot-outs. Thanks to the great work of organiser Dermot O’Connor, the A4 programme was expanded and produced in an innovative online version. As usual, each session went like clockwork, thanks to the good weather which only broke during the final awards ceremony on the final Saturday! There to present the awards on this now traditional local community highlight were Minister for Social and Family Affairs Mary Hanafin TD, Schoolboy FAI (SFAI) Chairman Michael O’Brien and Bray Wanderers’ Assistant Manager Keith Long. 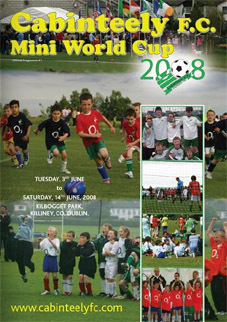 That everyone of the thousands present – players, parents, relations, friends, managers, referees and club officials left with smiles on their faces – the single objective of the tournament (in spite of the nail-biting penalty shoot-outs), is testimony to the hard work of Oisín and his organising committee. Full details of the tournament: event programme (pdf); online programme; final league tables and full tournament results. See also pics of the 56 team groups. Hundreds of other, general, tournament pics have been temporarily archived as at November 10, 2008. Our thanks are due to the many club parents and volunteers who helped organise and manage the event; to Dún Laoghaire Rathdown County Council for their continued support and 2008’s sponsors, who contributed hugely to its success: Commercial Wireless, Greenstar, Trinity Fund Administration, Chadwicks Builder Centre, Deerings Butchers Killiney SC, Portroe Stevedores Ltd., Visual Print Ltd., Bray, Alltracel Pharma Ltd., Tubs Direct, Palazzo Restaurant, Bray, fonemenders, hotelsinone.ie, Bits & Pizzas restaurant, Dún Laoghaire, O2, Washroom Supplies Ltd., Paul McGovern Car Sales, Bray, Kelly Noone & Co., Solicitors, Kelly Accountants, Clonkeen Road, Café Solo, Killiney SC and GSK. MWC2007 was excellently managed by Dave Spencer and Geralyn Hartnett and ran between June 5 and June 16. As with every past event, it surpassed the preceding year, with 559 players (7.5% up) allocated to 50 teams (an increase of six) in eight groups (as opposed to last year’s seven), playing on eight pitches (an additional one required this year). The programme was greatly expanded and produced in full A4 size, providing a memorable souvenir of the occasion. Each session went like clockwork, with great weather except for the final Thursday and part of the final Saturday. Everyone truly enjoyed themselves as witnessed in many of the pictures taken (see below). Newly reappointed Minister for Education and Science, Mary Hanafin TD, again generously gave of her time to attend the closing ceremonies and the prize-giving. She was ably assisted by former member, Andy Keogh, now starring in England with Wolves. Andy well remembers his own appearances in the MWC, especially those times he participated as a team manager. 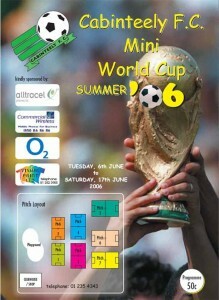 Full details of the tournament: event programme; full league results; final league tables and knockout round results. Tournament pics have been temporarily archived as at December 1, 2007. Our thanks are due to the many club parents and volunteers who helped organise and manage the event; to Dún Laoghaire Rathdown County Council for their continued support and 2007’s sponsors, who contributed hugely to its success: Commercial Wireless, The Odessa Club, Greenstar, BPI Business Analysis, Trinity Fund Administration, Chadwicks Builder Centre, Quality Hotels, Deerings Butchers, Killiney SC, Arclight Drama Studio, Laservision, Portroe Stevedores Ltd., Visual Print Ltd., Bray, Cowboys & Angels, The Parlour Restaurant, Alltracel Pharma Ltd., O2, GSK, William & Yvonne Barry and Kilbogget Park Project. In 2006, Jim Allen and his team ran the largest and most successful MWC since the event began in the late 1980s. They attracted large amounts of sponsorship and, for the first time, produced a comprehensive programme covering all games over the fortnight. Jim & Co. also had a word with the man above and organised some of the best weather we’ve ever had for the event! This year over 520 players participated. These were divided by age across 44 ‘international squads’ in eight different groups, playing during seven separate daily sessions across the two weeks. While Jim and his team recalculated league standings and knock-out positions each evening (after up to 25 daily games), our website was being kept fully updated with images from that day’s play. Minister for Education and Science, Mary Hanafin TD, attended the closing day’s prizegiving and congratulated all concerned – participants, spectators and organisers. She noted how clubs such as ours, with its large contingent of volunteers, added great value to the community and looked forward to meeting us all again in 2007. 2006 tournament sponsors included Commercial Wireless, Alltracel Pharma, O2, Visual Print Ltd., the KPP, Chadwicks Builder Centre, Killiney Grove Nursing Home, Deerings Butchers, Barry’s Dry Cleaners, Europa Foods and BPI Business Analysis.